City’s newest road honors Martin Luther King Jr.
Spokane’s newest street carries more than traffic. It holds legacy. And hope. 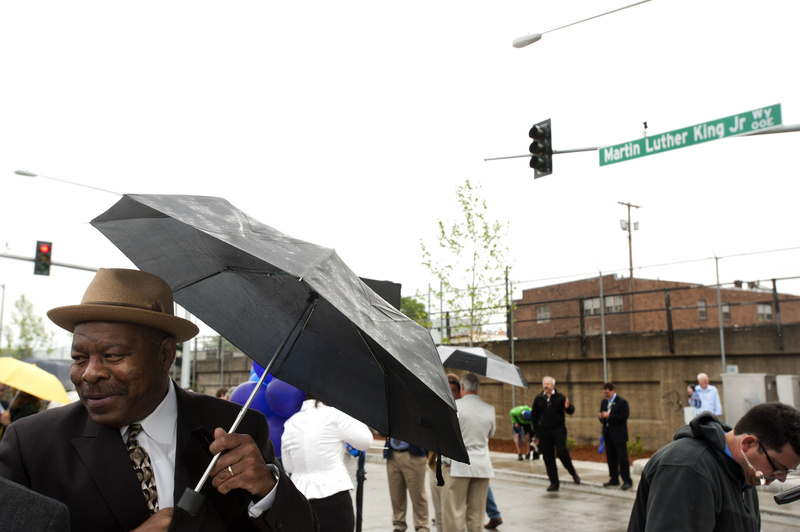 After decades of setbacks, the city has a grand stretch of a road named for slain civil rights leader Martin Luther King Jr. It peels east from Division Street as an extension of Riverside Avenue to skirt traffic around the growing university district. “It’s a fitting place to bestow such an honor,” the Rev. Percy “Happy” Watkins said on Thursday. “We have had a lot of frustrations over the years. We could just never find the right street because of this reason or that. More than 770 other communities have already named streets for King. Following a Thursday street-opening ceremony led by Spokane Mayor David Condon, Watkins climbed into the rear seat of a 1954 Kaiser Manhattan driven by Kay Howard. They led a caravan of classic cars down the half-mile-long Martin Luther King Jr. Way that follows the contour of the Burlington Northern Santa Fe Railroad line. Also called MLK Way by supporters, the opening is the culmination of a decade of political and construction work. A group of city and business leaders first approached U.S. Sen. Patty Murray about securing some federal dollars for such a project in 2002 as the broader plans for the Riverpoint Campus began to jell. Road building began more than a year ago and cost $3.8 million. The road is divided by a median planted with a type of sycamore called London plane, along with oaks and flowering cherry and pear trees. Decorative tall grasses and small shrubs dot the landscaping. It’s a functional design meant to look neat and perform its urban function of handling stormwater runoff and the occasional crowds of cars and people, said Ken VanVoorhis, owner of SPVV Landscape Architects. In the fall the trees will turn crimson and yellow. Spring blossoms of the cherry trees at the start of MLK Way will be bright pink. Eventually MLK Way will be extended. A second phase slated for construction next year will bring the road east and slip beneath the Hamilton Street Bridge and then link with Trent Avenue at Perry Street. A third phase will include a pedestrian and bicycle bridge spanning the railroad tracks and linking the Riverpoint Campus with the area north of East Sprague.